There is nothing quite like really getting away and my holiday to Durban was just that. However it did not start out perfectly – Jeremy’s luggage was left behind by the airline along with 85 others. It arrived later the next day and we set off up the Dolphin Coast for a few nights. 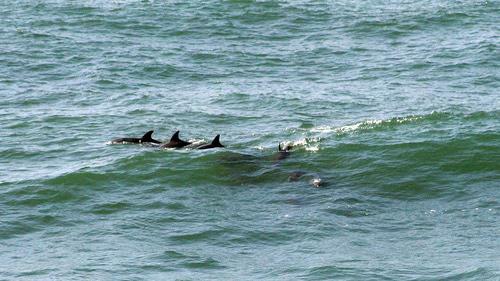 Sure enough we saw dolphins. The sea was rough and the currents were strong (but this is to be expected up the North Coast). I had a lot of laughs as I was knocked and swept off my feet. We also went up the ‘King Shaka Heritage trail. This was quite a disappointment, but none-the-less a nice drive. To see more pictures click here. 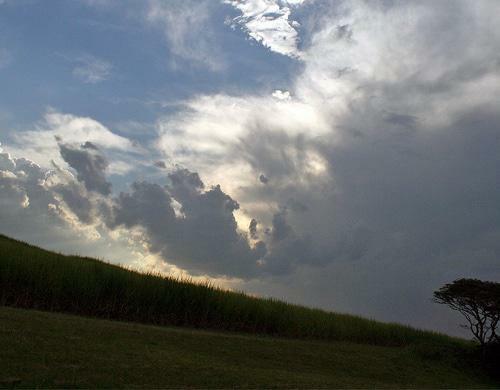 On our way back the sky suddenly turned dark and thunder storms rolled in over the sugar cane fields. The dramatic horizons reminded me of Turner paintings. It was a spectacular sight especially because we hardly get thunder storms in Cape Town. After our two nights spend on the beach and in the sugar cane around Ballito we went back to Pinetown. On Monday we headed out to the Valley of a 1000 Hills along the Comrades Marathon road. I loved the landscapes of rolling hills but the idea that people run 89km/59miles up and down those hills every year is hard to believe. 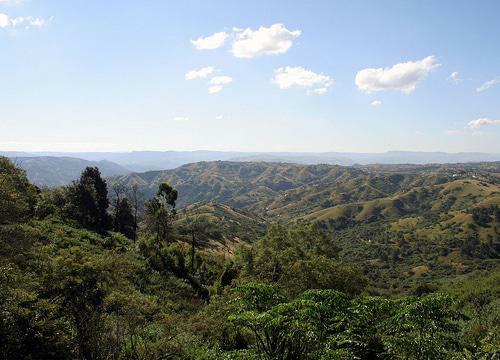 The Dusi Canoe Marathon also runs through these mountains. Although this might be a beautiful race to do, the risk of the number of diseases and other things that you are more than likely to pick up has always put me off (and the fact that there is more running than paddling). We also went to Howick Falls. 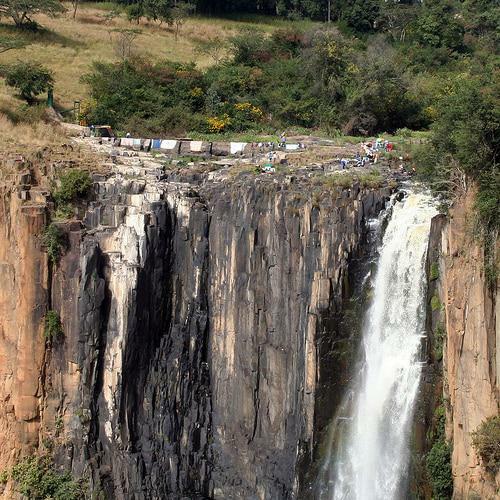 The waterfall is grand but the locals who do their washing at the top remind you that you are in Africa (Click here to see more photographs) . It was a lovely holiday and a fantastic break. This entry was posted in Blog and tagged Africa, Ballito, comrades marathon, Dolphin Coast, Dolphines, dramatic sky, Durban, dusi canoe marathon, Howick falls, Kim Shaka, landscape, Petermaritberg, pinetown, Shaka Heritage trail, sugar cane, thunder storm, tourism, Turner paiting, Valley of 1000 Hills. beautiful pictures. I left a note on your flickr about how cool must be those mountains for hicking (done before readin here). Why do you say there are risks of diseases??? what type of diseases?? Well, nonetheless, seems like you had fun. Great place. Florcita – The area is very rural. The land (as far as I know) is owned by various tribes. 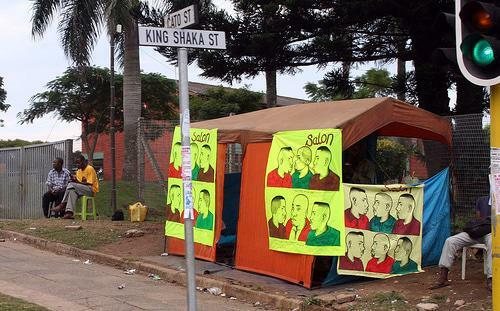 Most of the families, due to aids, are headed by children. There is no form of transport so to get to a place where they could earn money, it is a very long walk. With this all in mind, there is no form of sanitation. The waters are littered with rubbish and diseases such as cholera and tuberculouis are ripe in the area. Of all the people I know who have ever done the Duzi Canoe Marathon all of them have returned at least once with something. There is even a name for having a runny tummy: Duzi guts and about a third of the field do not finish the race becuase of this. Tick bite fever is also very common after this race. Crime is also very high. I have heard of many people who train for this race and have been mugged during the race for things like their watches. It is quite unbelievable although I am led to believe that it has gotten much better over the last few years (so sadly I do not think Hiking would be a very safe thing to do). It is one of South Africa’s biggest races with huge sponsorship so with all of these things, it is still a race many many people do. The rapids are big and the scenery beautiful – as you no doubt can imagine by looking at these pictures. Wow…really beautiful pictures of a great trip!Very interesting post and nice nature where you was.I will see your other pics at Flickr too!Thank you for sharing! Great blog entry, I love the pictures – especially the one of the locals doing their laundry at the top of Howick Falls. I run South Africa Travel Online, and every week we choose a blog entry as our blog of the week, and this week I’m happy to say we chose this entry. We’ve linked to your site from our travel newsletter.